100,000 is a Maritime History! Northern Shipwrecks Database... Over the last 26 years, Northern Maritime Research has accumulated a database of more than 100,000 North American shipwrecks covering 400 years. This database includes shipwrecks on all coasts of North America, offshore areas, the Great Lakes and the inland rivers and waterways. As well, this research details thousands of North American vessels lost in the West Indies and around the world during the Civil War and World War I & II. 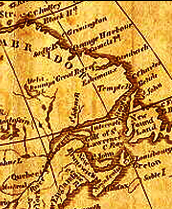 Here are some of the references used in researching American Shipwrecks and Canadian Shipwrecks. Every few years, an new version is made available on a single on a searchable CD-ROM in support of this continuing research. 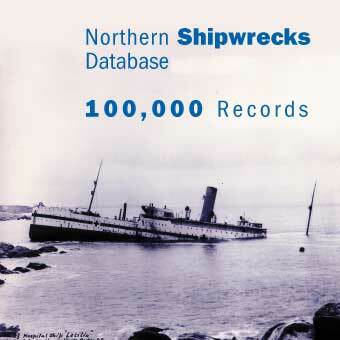 Designed for research purposes, the latest version of the Northern Shipwrecks Database CD is being used as a resource tool by many individuals with an interest in marine history, libraries, museums, archives, universities plus government agencies and departments. Besides many scuba divers, institutional users include: Transportation Safety Board, Lloyd's of London, National Oceanic and Atmospheric Administration, Department of National Defence, Hydrographic Services, Canadian Coast Guard, Marine Museum of the Great Lakes, Receiver of the Wreck, Milwaukee Public Library, Maritime Museum of the Atlantic, Bowling Green University, Queens County Museum, Mercyhurst College, Padre Island National Seashore Park, New Brunswick Museum, Marine Institute of Newfoundland, Halifax Regional Library and the Northumberland Fisheries Museum. Shipwreck information can be recalled by name; year month and/or date of loss, latitude-longitude coordinates; country, state or province; region and area of loss; official number; port of registry; place built; builder; owners; captain; as well as partial name, anniversary month and date, ause of loss, port of origin, destination or cargo, etc. A search for data provides the user with a `Summary Screen' of records matching their search parameters. This screen can be scrolled up and down. When the the desired record is located, clicking on the record and then on the `Details' option provides the user with a full-screen record. An on-screen print button permits the user to print the record. The Northern Shipwrecks Database uses 5 main screens to recall data. View them at Sample Screens. Sources of information include: US. Navy, US. Department of Defense, National Oceanic and Atmospheric Administration (NOAA), US. Coast Guard (USCG), Canadian Coast Guard (CCG), Great Britain Board of Trade, Lloyd's Registers and Lists, Merchant Vessels of the United States, Canada's Department of National Defence (DND), Transportation Safety Board, Canadian Sessional Papers, vessel registers and registrations, life-saving reports plus hundreds of old newspapers, books and charts, etc. The distribution of these shipwrecks is summarized on this Wrecks by Region page. The Wreck Tips provides assistance in locating data. For information not included on this page, send an email for a direct reply.